There are some amazing turbo trainers out there as you can see in our Bkool Pro 2 turbo trainer in-depth review and Wahoo Kickr 2 review. Also you may enjoy reading our Best Turbo Trainer in 2019 guide here. However, the turbo trainers reviewed above are pretty expensive, and not everyone wants or needs a high-end turbo trainer with all the bells and whistles. Sometimes a reliable and sturdy machine that lets you spin your back wheel indoors is all you need. Below we have the Top 3 Best Super Budget Turbo Trainers that cost less than £60 in 2019. Note that these prices are correct at the time of writing and sometimes prices can vary over time. The BDBikes magnetic turbo trainer has an RRP of £79.99 but at the time of writing is advertised at £56.99 on Amazon.co.uk. This turbo trainer uses magnets to generate ‘Eddy Current’, which are caused when a magnet spins relative to a metal disc. You can learn more about how magnetic turbo trainers work here. One of the main benefits of this magnetic resistance is that you can move the position of the magnet within the resistance unit via a handlebar mounted resistance lever. This in-turn changes the resistance applied to your back wheel, so you can have harder workouts if you choose too. In total there are 6 resistance levels. 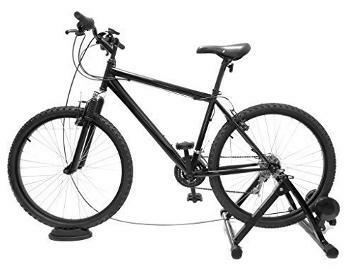 The BDBikes trainer also comes with a front wheel support and a 12 month (no quibble) warranty. There are roughly 700 reviews for this trainer with an average rating of 4.5/5 stars. Check out the latest price and reviews on Amazon here! The PedalPro turbo trainer uses a magnetic resistance unit just like the BKBikes trainer above. 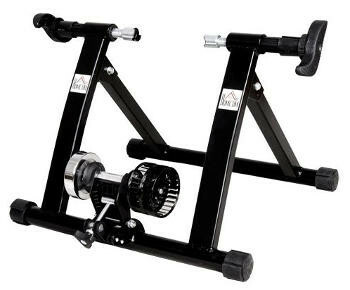 However, the lower price of PedalPro means that it does not have an adjustable resistance unit. Also it does not include a front wheel support. The PedalPro turbo trainer has an RRP of £149.99 but I do not expect you to pay anywhere near this. At the time of writing it is available on Amazon for £47.99. For around £20 more a variable resistance model is available although you would still need to purchase a front wheel support if you need one. 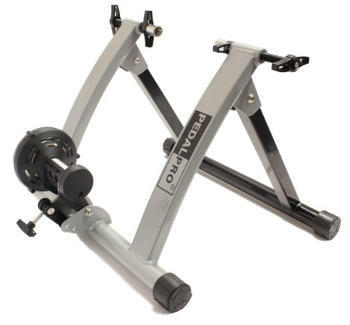 Read more about the PedalPro turbo trainer and see current price here! 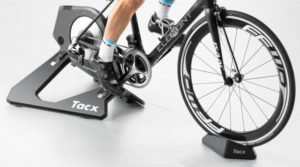 The Homcon turbo trainer uses a fan resistance unit (learn more about the different resistance technologies here) that generates smooth progressive resistance as you pedal. What this means is that the faster you spin your back wheel (i.e. the faster you turn your pedals) the greater the resistance gets. This is similar to what happens out on the open road and fan (AKA wind) trainers are known for being pretty realistic. Although, the more expensive wind trainers, such as the LeMond Revolution, are considered more realistic and the more budget trainers will not match this performance. Homcom also have magnetic resistance trainers that are slightly more expensive. That being said the Homcon indoor cycle trainer is a solid, well built, and has a stiff frame. The trainer has an RRP of £79.99 but at the time of writing it is for sale at £49.99. You cannot vary the resistance of wind turbo trainers but you can simply pedal faster and shift up through your bikes normal gears to get a harder workout. There are literally 100’s of turbo trainers out there ranging in price from less than £60 all the way up to £1000+. Because this price range is so huge so is the level of complexity of the turbo trainers. For £60 you will get a simple device that lets you spin your back wheel, which may be exactly what you need. If you do want to see what else is out there and exactly what you can get for your money, then click here to read our Best Turbo Trainer article.